Well, this is my new update. I changed the texture on the walls, I’m doing variations on another wall. For now I render in Maxwell SL 13, used 200 iso, 15 Sutter, most of the light emitters 40 to 60 watts in general. @kanooshka - Yes, you’re right and Andarra also advised me to have a focus on something. I’m still looking for a good camera position. While seeking a position I see another improvement in the textures I have to correct. @Assadshk21 - It will be a pleasure to see your update. @ Djprasun - sauce that does not seem … looks like blood! ha ha ha. I like your version. Im pretty happy on how my CG Challenge turned out, I learned a lot while doing this. I appreciate all the help you guys gave me. I’m not sure which one I like better, but I like them both, I hope you guys do too. Hi I haven’t post anything for a while but I still have been tweaking it. Fist of all i must say I’m not looking for a photorealistic render in here I’m letting some shaders pretty simple in order to create something a little bit cartoonish but still a 3D aesthetic. this is the version with corrections, depth of field and some post production: I’d really like to know what you think about it. This was my last attempt at this challenge. Even though I can´t compare my results to some on this forum, I believe I developed a sensibility for lighting in a 3d environment. I aimed to make this scene look like an old film picture. Besides paying special attention to that, I added a few subtle materials. Thank you very much for your advise. This is my entry image, Thanks. This is my final render, my last post on this incredible challenge, hope you like and greatly appreciate all criticism. 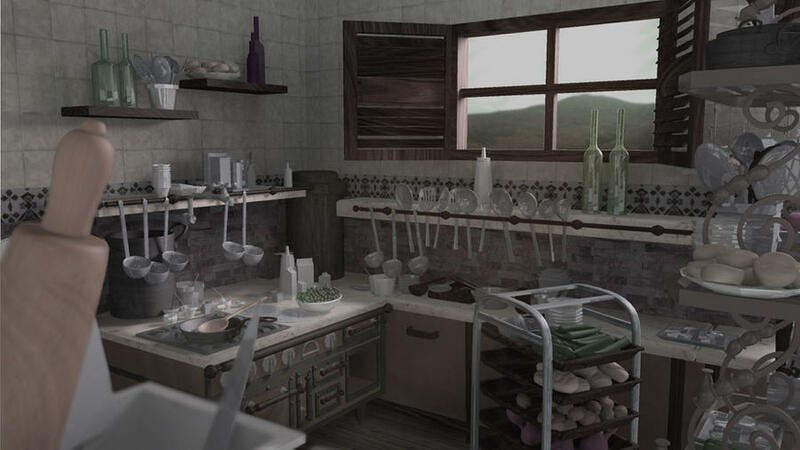 This is one image, but I hae to work a littlebit more in the textures, this is the lighting presets. Here are my lights, but I need to work in my textures. A key part of the look of the movie is the rich saturation in the dark tones. 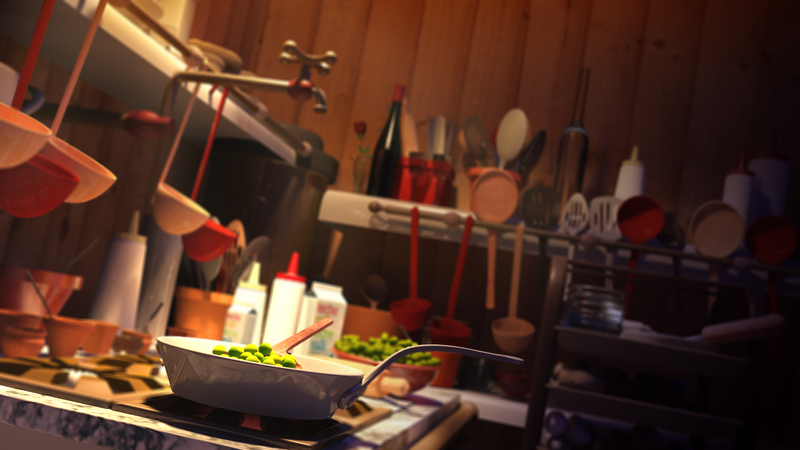 On the previous page, niravsheth posted some art from the movie along with his render. Look at the right wall, how richly saturated the purple is, even in the shadow of the shelf. There’s a CG cliché of having your shadows and occlusion go into dark grays and look desaturated that needs to be actively countered and fought in many places to keep this look. Right below it, Assadshk21 has an even better example of this. He has a still from the movie posted along with his render. Look at the side of the visible side of the stove that Colette is standing at. Even the reflections are a rich red color, and under the stove the shadow tone is a red amber. Compare that to the render where the shadows under the stove go into gray and black. 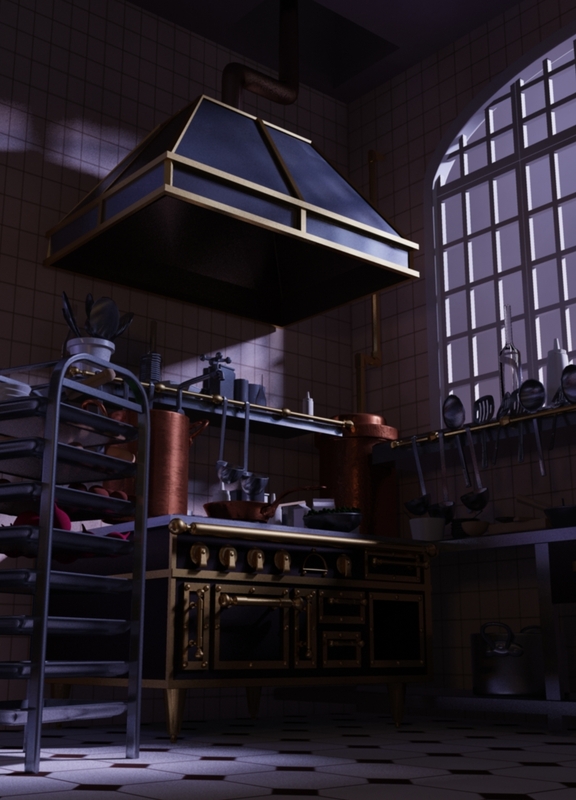 I can’t say all the shadows need to be lightened, because the area under the far stove in the distance seems very bright as if there’s a light leak, but certainly some warmer reflections and shadow tones could be added in many places in the image. Also, take a look at the ceiling lights. If something is really bright, it should proceed from a desaturated white at the core, just in the brightest spots, out into a more colorful warm brightness outside the core, with more saturation as you move into dimmer tones. For a light that bright, a little bloom that could be added in post could better integrate it into the scene. 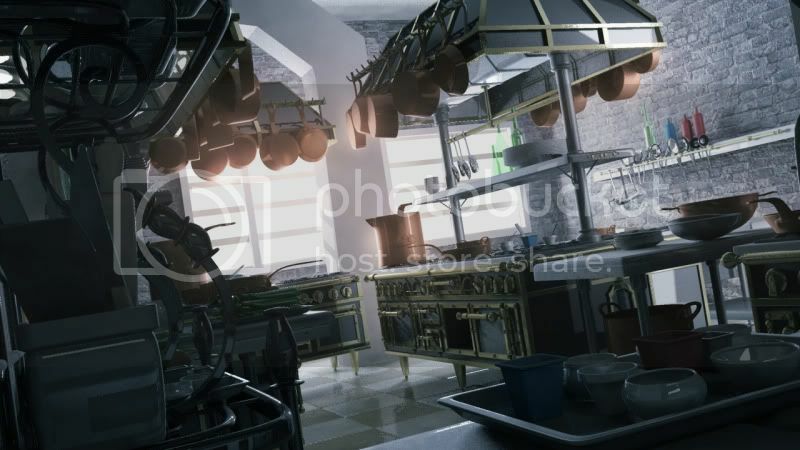 On the right side of the render, there are warm colored heatlamps on the ceiling, the reflections of those could use a little de-saturation in the core, just to show that they are brighter than the pots they are supposed to be lighting on the screen-right side. 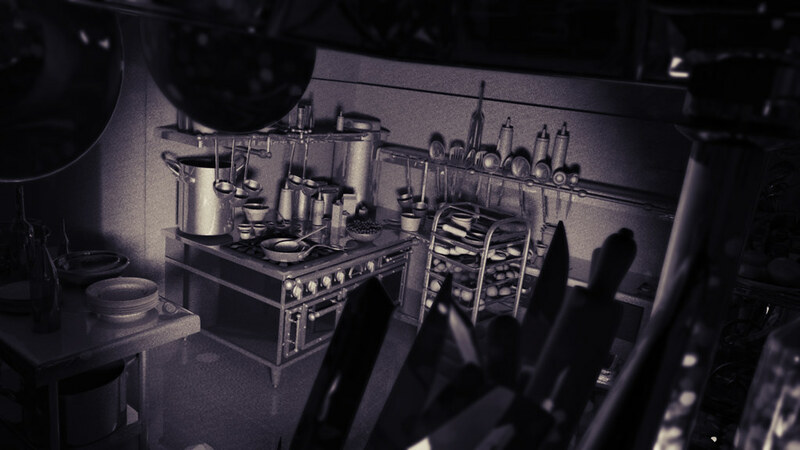 Once you have that warm light in the area, there should be warm bounce behind the heatlamp reflectors, and warmer light on the bottles and spoons below it, as well a warmer tone on the food cooking there. I’ve worked the textures and shadows, I was working with the bokeh as well as the volume light but both of them were greatly increasing render time without even looking good enough, I’ll have to figure out what’s the problem. Hi you all! this is my post for the CG challenge, I still have some thing I would like too fix but for mather of time I woul fixed until vacations!, I enjoyed alot the challenge, before I didnt knew how to put lights!, now Im in the way!, Thank to all the people that helped me with the advices! Hello! It’s been a while since my last post and I really made some huge changes, I took your advice to switch the color intention and it actually worked really beautifully, at least it was more pleasant for me.